As I mentioned before, this wool applique technique was a first for me. Love it combined with the batiks. I had bought a few wool kits over the years and a bundle of wool scraps now and then which is where I got most of the wool for this quilt. All the batiks were in my stash. I found a cute, "Home Sweet Home," button for the door of the "nut" house. I tried to outline all the wool applique pieces...can't walk by this quilt without touching it....those wool appliques just pop. My Thanks to Anne Sutton for making this BOM free on her blog in 2011. It was a project way out of my usual look...except I did do it with batiks. I hope to make her Snowbound pattern with wool appliques and batiks also. Another project to take to Paris! We are having an unusually long and warm fall. The snow is way too high on the mountains for this time of year...in fact there are usually several inches of snow where you can still see green grass in this photo...but I'm really not complaining. We had a huge wind storm yesterday so any leaves that were remaining are gone. I went for a nice little walk...no critter encounters. Trying out ideas on Plexiglas on top of the actual quilt really helps. As I worked back and forth between the Plexiglas and a photo of the quilt top I noticed a bigger star pattern...love when those little surprises happen. Last week I came up with a design for the big white areas...I'm almost ready to load it on the quilt frame. Yesterday I finished quilting "Henrietta Whiskers." It was a free BOM from Anne Sutton in 2011 so I'm not too badly behind on getting it quilted in 2013. I'm working on the binding and embellishments. It's definitely not a quilt pattern I would have ever bought but I really enjoyed making it...the wool appliques just pop...I'm always running my hands over them. Kind of makes me want to do some more wool applique. Welcome to my quilting world. Here is my entry in Amy's Creative Side Blogger's Quilt Festival - Quilt Photography category, an original design by me, Batiki Argyle. This quilt started out as a simple disappearing four patch but I always seem to have a need to make a project a little more challenging. I also often find myself thinking of ways to "connect" blocks together. A few hours spent on EQ7 led to this design. This pattern is free on my blog...just look to the top right corner for my free patterns. So far I just have one but I do hope to add more soon. I quilted Batiki Argyle on my Nolting Fun Quilter. I used double batting to enhance the quilt design and give it a heavier weight. For years I have been doubling up on quilts to keep warm in my home...after all I do live in Alaska. After reading about other quilters doubling their batting, I tried it and have pretty much been hooked since then. This quilt was given to a man who has been a wonderful mentor to my 19-year-old son. For the first time I hand-embroidered the label. I loved the result and will probably do this again when I gift a quilt. I frantically raced outside to snap a photo at 3 p.m. because I didn't know how much longer I would have sunlight...the sun was hugging the tops of the mountains. And I'm still quilting away. I loaded Anne's Sutton's free blog quilt, "Henrietta Whiskers," onto the frame. Lots of thread color changes and the cream color is giving me tension issues. Soooo... despite it's small size it is going to take me a few days to finish. I have a list of about 10 things I really miss about Alaska when I am in Paris and the monthly Thursday meeting of Breakfast Club is at the top. It is so motivating having that deadline for show and tell every month! We had a great "Show and Tell" this month. Carol was there...we missed her the last two or three sessions. She was busy quilting (and working in her fabulous vegetable garden). Back side. That orange backing is fabulous! Definitely two quilts in one. Carol had a series of table runners...here's a mini twister in blue batiks. Here's a great idea...Carol had two orphan blocks from a project and turned them into this great runner. Wouldn't this make a great gift for an invite to a friend's during the holiday season? I need to make somethings like this to have on hand! Carol participated in a Buck-a-Block program (Thangles designed projects that are available through many quilt shops). Carol turned hers into this great runner. Look at this great little bag. I promise I will track down the name of this pattern and let you know. Carol takes orphan blocks and adds them to the bottoms of longarm projects when she is has room and then turns those quilted bits into bags. Love this idea! This quilt looks soooo much like Carol's comfort zone! Scrumptious colors. Carol's son called this the "Equal," quilt because it looked like equal signs to him. Very funny. Another batik scrap quilt! September's Breakfast Club we used Scrap Crazy templates from Creative Grids. Erin completely finished her Christmas version. Very Merry! This is Marie's almost done top. She worked on adding borders yesterday in our class and may have even gotten it done. Marcia brought in a quick table runner pattern as an option to work on yesterday. We meet at the quilt shop, "Seams Like Home," and they are in the middle of moving to a new location so a huge sale started yesterday. We spent most of our day shopping...eating and visiting. Not much sewing but it sure was fun! And yes, I bought more batik fabric! I had great fun bringing in my quilts. Summer Breeze from Kim Brackett's, "Scrap Basket Surprises." I used a Grasshopper Bali pop and then a background fabric. One of my favorite quilts. I think I will make this pattern again. Tropical Waters...an adaption of a free internet pattern from Anthology Fabrics. It requires 2 1/2" strips and 10" squares. I used a Key Lime Bali pop and a set of batik squares I got from Connecting Threads. I dropped the borders and squared it to 70 inches. Blues Reveille is an adaption of Carrie Nelson's "Reveille," from her book, "Another Bite of Schnibbles." I basically made many more blocks from charm squares (5" squares) and added sashing. This quilt reminds me of a favorite pair of old denim jeans that are so soft and comfortable. I match my quilt! This is another free pattern on the internet from Bonnie Hunter at Quiltville...Pineapple Blossoms. Her pattern is written for 2" or 2 1/2" strips. I did it in 2 1/2" strips with two Mulberry Bali pops. It is huge - 94 x 109". We were in a smaller space yesterday at the shop so it was hard to get a full photo. We are supposed to have a cloudless sunny day tomorrow and I hope to take a photo of it outside. I brought one other quilt but the photo was out of focus. I got all these quilted in the last month...a personal record! New titanium needles were the solution to my tension problems the previous month! Another completed quilt! Sweet! This is one I started in May and of course...made changes to the original pattern that made it sooo much bigger. Then I thought up a quilting design that required holding acrylic templates in place...slows down my quilt-stitching rhythm. I washed it yesterday and it puckered up very nicely. I did my standard double batting...I like having a little heavier quilt for Alaska...plus it really helps show off the quilting design. Reveille Blues - 64 x 71 1/2"
Quilting on my midarm, Marta, goes so much better when I have new needles...those are things I can't run out and buy....I always have to send away for longarm supplies. I love titanium needles for my midarm and my domestic sewing machine. They are gold in color, extra sharp and great for the higher thread count of batiks which is pretty much the only fabric I work with anymore. I had lunch with my youngest son, Zack. He totaled his truck a few weeks ago and just got this white one. He's a little scruffy...he works as a small airplane mechanic so he is chronically covered in grease! Good thing he doesn't read my blog because as usual...he didn't want me to take his picture! I'm going out to eat almost every day this week...trying to cram in lots of visits with friends and my sons before I leave...three weeks left in Alaska. On my way home I had to stop in one of my favorite quilt shops in Anchorage, the Quilted Tree. Right in the front door were bolts of Hoffman batiks that had just arrived. Torture Me! I don't need anymore fabric but it was impossible for me to leave without a package of the latest Bali pops and some coordinating yardage. Do I have plan for these? Sort of! It took me three days of doodling but I finally have a quilt design figured out for my next top and it is loaded and ready to go. Breakfast Club is Thursday...hopefully I will have this quilt done in time for show and tell! Tropical Waters moved into the completed pile of quilts. A little better look at the quilting by checking out the backside. More of those fabrics I collected on Hockeymom trips. Today's project...hand stitching the binding on, "Summer Breeze," and burying my quilting threads. And I hope to get another quilt loaded on the frame. A quilt more in my color comfort zone. Some more furniture has come home...two bongo bar stools. While I like them overall...there is something missing from my original inspiration...they need some oversized and amazing nailheads...yet another project! I get so frustrated when I feel like I'm in the book, "If You Give a Mouse a Cookie." The main road to our house has been under construction all summer...now fall. The new grass that has popped up has attracted herds of moose. 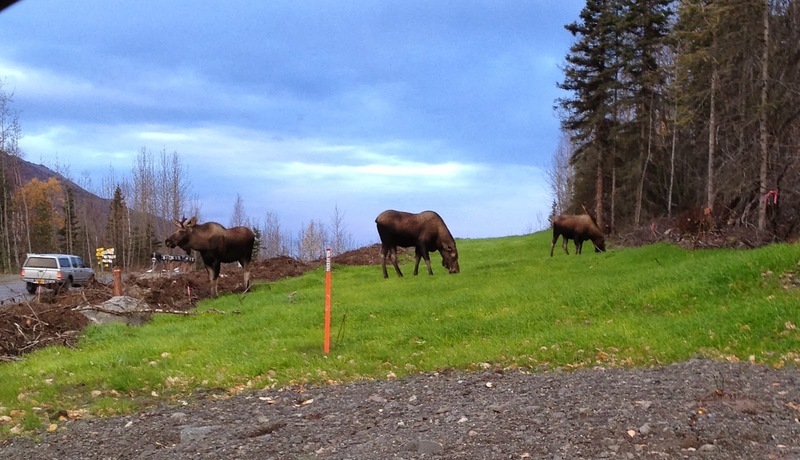 Moose are not herd animals so this is so odd to see three together. It's been awhile but looks like I'm due to link up with Kathy's Quilts Slow Stitching Sunday. This is such a fun pattern, "Sidelights." Great for a focus fabric. I think I might call my quilt, "Hockey Mom." I know...a completely strange name! I bought the focus fabric while traveling with my son to a hockey tournament in Colorado Springs...many...many...many years ago. I jumped at the chance to put my sons on traveling hockey teams because I went on every trip too...just for the opportunity to visit quilt shops around the country. I'm rather addicted to "J" hook feathers...this time I added some circles on the spine. "Tropical Waters," is off the frame. This quilt is a variation of a free pattern called "Ripples," on the Anthology Fabrics website. Mine is without borders and I made sure to rotate the blocks of strips so a horizontal block laid next to a vertical block. "Ripples," had a more random layout. Like many quilters....I have control issues when it comes to random layouts. I had the sweetest piece of batik for the binding...a striped-tie-dyed piece...I'm pretty sure I bought it on a hockey trip too. It is nicely aged fabric. And...I've got another small quilt loaded on frame. Frustratingly, I need to dedicate my day tomorrow to dealing with paperwork for renewal of my French visa. My husband was allowed a three-year visa but not trouble-maker-Debbie! I will have to renew every year. Pictures...fingerprints...sign here...sign there. I hate bureaucracy in any country. Hopefully this is the start of a roll to finish quilting several more tops! I hope to get the binding on tomorrow....I will be waiting for a repairman at my son's apartment. Hand stitching the binding down will be a good time-passer while I wait.